Coconut Software has officially moved into new offices in both Toronto and Saskatoon! Our boxes are unpacked and we want to give you a quick peek inside. 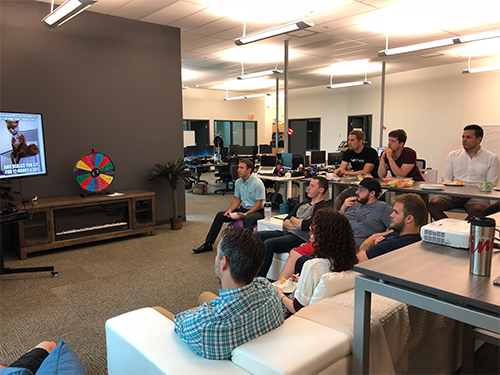 The new locations will put us in better proximity to some of our leading enterprise clients and give us plenty of room to expand our continuously growing team! We wanted access to a place that brings people together. Whether for a morning coffee, lunch, or an afternoon beer, folks need a spot to congregate. The communal areas provide the perfect place for a casual chat, especially with someone you might not bump shoulders with during your day-to-day schedule. These areas also serve as a great meeting spot for team meetings, or a nice working area when you need a break from your desk. Having an open office keeps people interacting and ideas buzzing. Everyone has a seat, but sitting in the same spot all day can be draining. People need to move, and a change of scenery can spark creativity. So we knew we wanted a location that would give us a fresh view when we need a spark. With an open space office it was important to have break out rooms where teams could have meetings, or someone needing a quiet space could go work. Each room has been given a fun themed name, either after different kinds of coconuts or different tropical islands. Great Eats – You’ll never have to worry about brown-bagging it with close proximity to a variety of excellent meal options. We are a matter of feet from the Union Market that takes place for July and August! GO Transit – Coconut’s central location is perfect for commuting via transit on both the GO and the Subway. Air Canada Centre – The best in sports, music, and more is only a 5 minute walk to the ACC. Building BBQs – 40 University hosts building wide BBQs so you can get to know the individuals you see in the elevator every morning. The Scene – Regular events that provide tenants with opportunities to network, develop new synergies and create an environment that fosters innovation and collaboration. 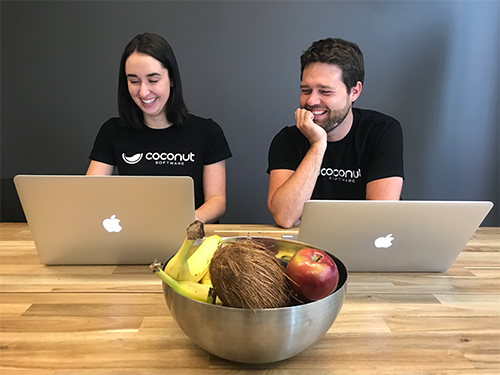 What’s it like working at Coconut? Modernizing how Banks and Credit Unions Engage, because everyone’s time is money.